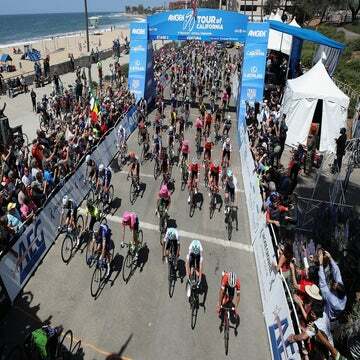 Tyler Farrar (Garmin-Sharp) won stage 4 of the Amgen Tour of California on Wednesday in Santa Barbara. The win was the second of the day for the Garmin squad after Ramunas Navardauskas won stage 11 of the Giro d’Italia from the breakaway. U.S. criterium champion Ken Hanson (Optum-Kelly Benefit Strategies) was second in the Amgen Tour’s 134-kilometer leg, with Gianni Meersman (Omega Pharma-Quick Step) third. Janier Acevedo (Jamis-Sutter Home) finished with the peloton to defend his overall lead with four days of racing remaining. Frank Pipp (Bissell), Chad Beyer (Champion System), and Nathan Brown (Bontrager) initiated the day’s breakaway and were soon joined by Marsh Cooper (Optum), Jim Stemper (5-hour Energy-Kenda), and Pipp’s teammate, Chris Baldwin. The peloton deemed the mix of riders in the move acceptable and the group was made. Acevedo’s Jamis teammates patrolled the front of the peloton with Garmin and Cannondale, which each contributed a rider, and the escapees built up a maximum advantage of just over four minutes. Stemper entered the day second in the mountains classification, five points behind Bissell’s Carter Jones. With Pipp and Baldwin in the move, Jones had two teammates to defend against the 5-hour Energy rider. Baldwin and Pipp took top points at the day’s first KOM, the Cat. 4 rise to CA 150. The five leaders rolled onto the second and final rated climb of the day, the Cat. 3 Casitas Pass, with 1:35 over the peloton. Brown attacked just under 1km from the summit of the climb and quickly took a 10-second gap. Baldwin and Pipp sat in the group, Pipp eyeing Stemper. Brown took top points and Baldwin and Pipp locked up the rest, keeping Stemper out of the mountains standings on both of the day’s climbs. Cooper attacked over the summit and Baldwin followed. Pipp did as well and forced Stemper and Beyer to chase, with Brown still off the front. Behind the breakaway, Vacansoleil-DCM took up the chase, 1:06 back down the road. Juan Antonio Flecha led the bunch over the climb, 32km from the finish. The six breakaway men soon came back together and with 30km to go, they held onto a 55-second advantage over the peloton, with Cannondale and Omega Pharma sitting on the front without much urgency. Cooper attacked again, up the right gutter, on a short ramp, springing himself, Baldwin, and Brown. Stemper and Beyer, who spent Tuesday in the long breakaway, were caught out again. They closed the gap, but Pipp could not and the American was off the back of the support cars by the time he topped out. When the peloton rolled onto the ramp, Lieuwe Westra (Vacansoleil) went to the front and drilled it. Over the top it was Ted King’s (Cannondale) turn and the gap plummeted to 35 seconds on the descent, with 27km to go. Pipp made contact again with the leaders, but their TV time was limited. With 23km to go, RadioShack massed at the front and floored the pedals. The seven riders led into a winding section of road, Jens Voigt stringing the peloton out. The push took the air out of the escape and the peloton could see the six leaders for the first time in hours. While the RadioShack push didn’t split the bunch, it did nearly spell an end for the breakaway. Omega Pharma and Cannondale again took up the chase with a rider each, BMC Racing lined up behind them. The gap was only 15 seconds with 20km remaining. Stemper attacked with 19km to go, giving the breakaway a little more life, and Pipp took up the work on the front. Cooper and Brown countered and left their four companions behind. Pipp and Stemper tried to bridge across, but Baldwin and Beyer were done. The peloton caught them with 17km to go. Meanwhile, Brown attacked Cooper. The Canadian pursued, but soon waited for Pipp and Stemper to come across and help him close the gap. Their help wasn’t enough, however, and Brown continued on alone. Brown’s advantage grew to 30 seconds with 16km to go. The effort would earn the 21-year-old the stage’s award for most courageous rider. Cooper’s Optum teammates, with Hanson third wheel, went to the front and slowed the bunch slightly, but UnitedHealthcare pushed past them on the right. With 13km to go, Brown’s advantage with 45 seconds. RadioShack, Optum, and UnitedHealthcare each rode at the front of the peloton and Voigt soon attacked leading into a short ramp 11km from the finish. Lucas Euser (UnitedHealthcare) bridged across and the pair soon rode through Cooper, Pipp, and Stemper. The move strung out the bunch and a pair of chasers — a Garmin rider and stage 3 winner Peter Sagan (Cannondale) — bridged across. The group rolled past Brown with 12km to go. BMC Racing drew the peloton back onto terms with the Slovak champion. J.J. Mendes (NetApp-Endura) jumped over the top of the ramp and BMC Racing again led the chase. Sylvain Chavanel (Omega Pharma) attacked on the descent and created a split with 10km to go. The group came back together quickly, however, and another NetApp rider countered. There was nothing doing, though, and that move soon came back as well. Garmin massed at the front of the peloton, with David Zabriskie leading a mass of blue jerseys, but it was Ted King again taking up the pace-making for Cannondale and Sagan. King led the bunch through a series of sweeping corners with 6km to go. King swapped turns with a single Omega Pharma rider, with Garmin’s five riders organized behind. Vacansoleil charged to the front briefly with 5km to go, but Zabriskie soon took over, four teammates trailing him. A lone NetApp man sat behind Farrar. On his wheel, Cannondale lined up with Sagan fourth in line. Zabriskie pulled off with 3.3km to go, leaving Jacob Rathe in the wind. Chavanel led Meersman up the left side of the road and they overcame the Garmin train just before a roundabout. Matt Brammeier (Champion System) took a flyer in the chicane with 2km to go. The Irish champion stole a quick five seconds and pushed on alone. Garmin led the pursuit and with 1km to go, Brammeier was nearly caught. Orica-GreenEdge led the bunch around the Champion System rider with 900 meters to go. Vacansoleil took over, but it was Optum that led out the sprint, taking command with three riders 800 meters from the line. Alex Candelario was the final leadout man for Hanson and jumped with roughly 500 meters to go. It was a long way to the line, however, and when Hanson jumped into the wind, he was unable to create any separation. Farrar’s legs proved best. He closed on Hanson’s left and came even with the Optum man with 100 meters to go. The former Tour de France stage winner took the victory, his first of the season, Hanson even with his rear wheel. Meersman came up the middle and held off Sagan, who was charging in the wind to the left, for third. The eighth Amgen Tour of California continues Thursday with the 185km fifth stage from Santa Barbara to Avila Beach.